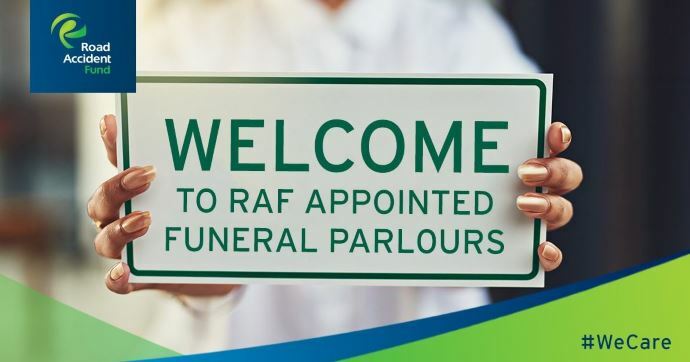 At a time of great emotional pain and suffering, the RAF extends a consoling arm to the bereaved through its funeral programme. The programme began in 2014 in order to take a more proactive approach to supporting families faced with the financial burden brought about by the death of a loved one during an untimely accident. During the 2016-2017 financial year, the RAF’s total expenditure on funeral claims increased by 13 % from R118m in 2015/16 to R134m. The average value spent on a funeral claim increased by 11% from R13,732 in 2015/16 to R15,264. Support is provided through a Panel of Funeral Undertakers, who ensure the deceased is given a dignified burial. The Road Accident Fund Act stipulates payment can only be made for necessary costs, namely: transportation of the deceased body; provision of the coffin or burial shroud; preparation of the deceased body (including embalming); storage of the deceased body; arranging for issuing of a death certificate; burial or cremation of the deceased body; hiring of equipment to lower the coffin into the grave; and grave fees. The following costs are excluded: tombstones, catering, flowers, family transport and funeral programs. Meanwhile, the family of the deceased may claim for the reimbursement of necessary funeral or cremation costs, provided the family can prove that someone other than the deceased was negligent, or at least partly negligent for causing the road crash. 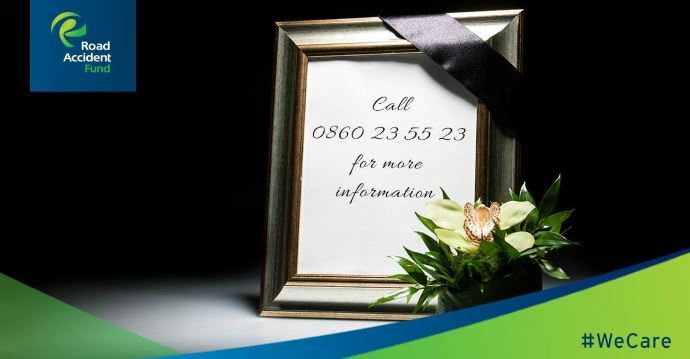 Any queries regarding funeral claims can be addressed through the RAF Call Centre on 0860 23 55 23, Monday to Friday, between 07:45 – 16:00. Assistance is available in any of the 11 official languages. Claimants can also engage with the Fund on social media: Twitter: @RAF_SA; Facebook: Road Accident Fund; and Instagram: RAF_ROAD. What else does the RAF cover and pay for? General Damages for serious injury (claims for pain, suffering, and loss of amenities of life). Loss of Earnings in the event that the road accident victim was unable to earn an income, or is no longer able to earn an income, due to temporary or permanent disablement. Loss of Support in the event that a family loses a breadwinner due to a road accident. Medical Compensation in respect of the accident victim’s past and future accident related medical treatment, assistive devices, caregivers, and necessary structural changes to the vehicle, home, and workplace. A claim is lodged on a prescribed statutory claim form (Form 1 is to be used in respect of claims arising prior to 1 August 2008 and RAF 1 from 1 August 2008 onwards). The form provides basic information on the claimant, the vehicles and parties involved in the collision, the date and place of the accident and the amounts claimed. It also contains a medical report by the treating doctor. The claim form must be accompanied by an affidavit from the claimant setting out the particulars of the accident. Claimants are requested to provide copies of any witnesses’ statements, the police report, hospital records, and documentary proof in respect of the amounts claimed, e.g. receipts. The drivers, and owners (if not the driver) of the vehicles involved in the collision must furnish details of the accident to the RAF on a statutory accident report form (Form 3 is to be used in respect of claims arising prior to 1 August 2008, and RAF 3 from 1 August 2008 onwards). Once a claim is submitted, the RAF registers it on its claim system and commences with its investigations. The RAF determines whether the claim is valid (i.e. was there a road accident, does the claim documentation comply with statutory provisions, was the claim submitted in time, etc. ), and what the merits of the case are (i.e. the degree of fault, blame or negligence to be ascribed to the drivers of the vehicles and the claimant respectively). The quantum is also determined (i.e. the amount of the damages or losses suffered). If a claim is incomplete, the RAF calls for additional information and supporting documentation to enable it to better assess the matter. If the claim arose after 31 July 2008 and general damages are claimed, a Serious Injury Assessment Report (RAF 4) must be submitted to the RAF confirming that the injury sustained is serious for the purposes of the Act. In instances where the claimant elects to claim directly from the RAF (i.e. without an attorney), the RAF provides assistance to the claimant to lodge the claim. Who qualifies to claim for damages? Prove the damages claimed as a result of the injuries/death caused by the road crash. Who doesn’t qualify for a claim? Does one need legal representation when making a claim? 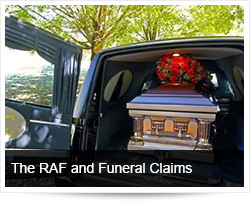 No, claimants can claim directly with the RAF. Direct claims improve service delivery by the RAF through direct interaction between the RAF and the claimant, something which is not possible where the claimant is represented by an attorney. The direct claimant, therefore, has first-hand feedback from the RAF on the status of the claim. Payment of the compensation is also made in full directly to the direct claimant. The payment received by the direct claimant will also not be reduced by an attorney in respect of contingency fees and expenses. What documents must one provide when making a claim? A copy of the traffic collision report; inquest report; or charge sheet. Proof of the spouse’s or life partner’s income. A copy of the specified invoice from the funeral parlour. On average, how long does it take for a claim to be finalised? This varies from claim–to–claim and differs between the types of claims. For example, a funeral-expenses claim is generally settled quicker than a loss of support claim, because it is less complicated. What happens if one feels they’ve been short-changed by RAF? If represented by a lawyer, the lawyer will lodge a complaint with the RAF on behalf of the claimant. For direct claims, the claimant is consulted throughout the process and is constantly aware of the amount that they are claiming for. The RAF has a Direct Claim Management Policy and Framework in place that specifically provides for the management of disputes by direct claimants, should a dispute arise. Is there anywhere one can complain when they feel their case is not taken seriously/taking too long to settle? 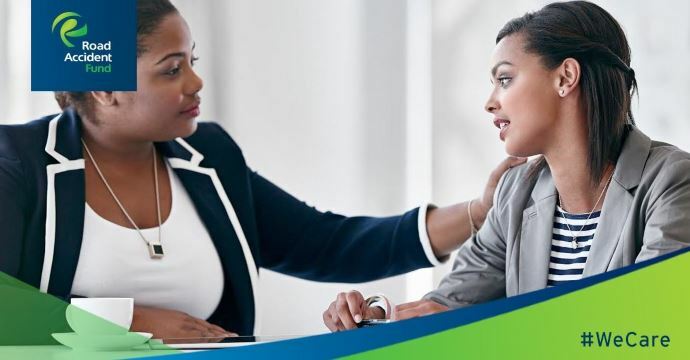 Customer service is a top priority at the RAF and we remain committed to ensuring that we honour our mandate as the caring arm of the government by assisting motor vehicle accident victims to lodge claims. People with complaints can contact our Call Centre on 0860 23 55 23 from Monday to Friday between 07h45 to 16h00. The Call Centre agents will assist in any of the 11 official languages. Apart from the compensation paid to the claimant, the RAF also assists claimants who require on-going medical treatment by offering an undertaking to access such treatment and rehabilitative services through its post claims settlement department. Assistance takes many forms, including structural changes to the house (e.g. ramps, bathroom modification), workplace, and motor vehicles; payment of caregivers in the case where the injured needs assistance with their daily activities, or future medical care; and access to assistive devices such as a wheel-chair. The RAF has case managers who visit accident victims during their recovery at home, providing full on-going support for claimants with serious injuries. The RAF assists to rehabilitate claimants. In order to do this, the organization issues an Undertaking Certificate to the claimant. An Undertaking Certificate is a contractual agreement between the claimant and the RAF to provide for current and future medical needs that the claimant may have relating to the injuries sustained in the road crash, while their claim is being processed. The RAF first assesses whether the claim is valid (i.e. was there a road accident, does it comply with the statutory provisions, was it submitted on time, etc. ), and what the merits of the case are (i.e. the degree of fault, blame or negligence to be ascribed to the drivers of the vehicles and claimant respectively). Once the RAF’s liability is established an Undertaking Certificate is issued to the claimant. The quantum of the claim is then investigated (i.e. the amount of the damages or losses suffered). If a claim is incomplete, the RAF may call for additional information and supporting documentation to enable it to better assess the claim. The payment of caregiver costs is one example of benefits provided by the RAF to the claimant under the Undertaking Certificate. Caregivers care for claimants who are living with, for example, paraplegia, quadriplegia and amputation as a result of the accident. They may be a professional nurse or an informal caregiver, such as a family member, friend, neighbour or any other person who monitors the claimant and attends to his, or her, needs. Their duties include taking care of the physical well-being (such as hygiene and exercise) of the claimant, helping the claimant take their medication, looking after the claimant’s travelling needs, and performing light household duties in, and outside, the house (such as meal preparation), that the claimant may no longer be able to do due to his, or her, functional impairment flowing from the injuries sustained in the car crash. Claimants commonly choose a family member as a caregiver because of the intimate nature of the required care. RAF’s geographical footprint and where people can access the services. Claimants can access the RAF at any of its five Regional Offices in Pretoria, Johannesburg, Durban, East London and Cape Town; 100 Hospital Service Centres (HSC) at public hospitals countrywide; or six Customer Service Centres (CSC) in Durban, Bloemfontein, Mafikeng, Polokwane, Kimberly and Nelspruit. The RAF can be contacted through the Call Centre on 0860 23 55 23 (Mon-Fri: 07h45 to 16h00). A detailed list of RAF’s Regional Offices, HSCs, CSCs and Walk-in-Centres is available on the website: www.raf.co.za. Social media users can follow the RAF on Twitter: @RAF_SA, Instagram: Raf_road, or Facebook: RAF SA Road. The RAF is responsible for the payment of compensation in accordance with the Act for loss or damage wrongfully caused by the driving of motor vehicles. This year, the Fund is celebrating 20 years of caring for road users after dealing with a legacy of challenges. We continue to: aim for service excellence; increase accessibility through ongoing public engagements, and taking services to the doorsteps of communities. Introducing a direct claiming process so that car crash victims can claim without a lawyer, thus saving time and legal costs. Taking our services to the people by engaging directly with claimants countrywide (e.g. the award-winning ‘RAF on the Road’ outreach campaign). Increasing our footprint to 100 HSCs, 6 Customer Service Centres (CSC), and 5 regional offices. Improving access points by introducing other channels, such as two mobile office buses (‘MobiRAFs’), one for coastal regions and the other for inland use. However, the RAF’s funding and legal challenges still continue to burden it, making it difficult to operate. Fraud is also extremely problematic. Another challenge is that claim access to car crash victims is not open to everybody, while some claimants do not use their settlement for the intended purpose (medical expenses etc.). Instead, they spend the money on unrelated luxury items such as fancy cars, holidays, etc. Initially, victims of road crashes had the right to claim damages from the wrongdoer in terms of the common law. However, the reality was that many wrongdoers were not financially able to meet these claims, and where they were able to do so the wrongdoer and his family could be left destitute. The State intervened and introduced the first Act in 1942 which created a fund against which claims could be lodged. The RAF is the current successor of the various funds that evolved over time in terms of a number of Acts passed to regulate these claims. However, the Road Accident Fund Commission, under the chairmanship of Justice K. Satchwell recommended that a new authority, called the Road Accident Benefits Scheme (RABS), should be created to implement a "no-fault" system that provides defined benefits in the form of periodic payments. The RABS Bill which is being processed by the Department of Transport (RAF’s mother body) was tabled in Parliament earlier this year and has been referred to the Portfolio Committee on Transport. The Bill provides for the establishment of a new RABS Administrator (RABSA) to replace the current RAF. Under RABS, payments will be made monthly instead of in lump sums, defined benefits will be available on a no-fault basis to a wider range of people and service providers, and vocational training will be facilitated in the event that the car crash victim cannot go back to their previous job. It is anticipated that the claims process will be much less cumbersome under RABS than is currently the case under the RAF. The move to a no-fault scheme, where benefits are pre-defined and paid in a structured manner, ensures faster claim administration and delivery of benefits. In terms of the scheme, payments will be made directly to claimants, medical and healthcare service providers. The Bill presents an opportunity for all those affected by crashes to access support fairly, without exclusion on the basis of income. The role of attorneys under the new scheme will be limited considering the removal of the requirement to prove fault and due to benefits being defined. Linda Rulashe: Senior Manager Media & Public Relations. Tel: (012) 621-1605. Thandeka Ngwenya: Media & Public Relations Specialist. Tel: (012) 649-2163.